Description: An erect to spreading shrub growing from 1.5 to 4 metres tall. The leaves are sticky leathery. The foliage is evergreen, with the leaf shape usually spatulate (spoon-shaped). 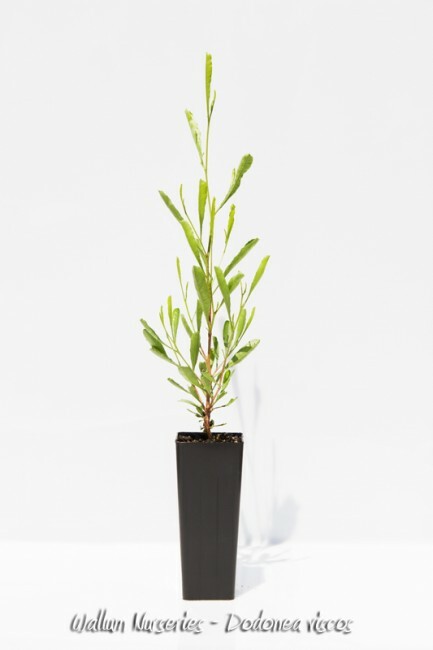 In general, Dodonaea viscosa is an extremely hardy species and is able to resprout from the base. The stand-out horticultural feature of this species is the brilliant colour of the capsules. Other desirable features include its successful use as a hedge due to the dense habit. There is also a popular non-native form with purple foliage, referred to as Dodonaea ‘Purpurea’. Dodonaea viscosa flowers are inconspicuous, with no petals. These flowers occur during spring and summer and are less than a centimetre in size. The plants are dioecious; i.e. the flowers are male or female and usually occur on separate plants.